Napoleon Bonaparte's Army of Italy Lays Seige to Mantua. Map of Theatre of Operations May 24th to August 10th 1796. The French spent much of the month of May and even June and July in consolidation. Reaping the rewards of sucess in the field, supressing revolts, making raids both to intimidate the possibly hostile and to loot. During May Bonaparte extorts large contributions from the Dukes of Parma and Modena. May 17th - Duke of Modena signs armstice pledging contribution to French of seven and half million francs in cash, plus food, ammo and art. June 4th - French Army of Italy re-organized. June 5th - Bonaparte at Brescia signs agreement with representatives of the King of Naples. June 15th - Augereau's and Vaubois' divisions depart on punitive expeditions south, Augereau marches on Bologna, Vaubois on Reggio. June 23rd - Bonaparte at Bologna comes to agreement with representatives of the Pope. June 26th - French enter Tuscany. Vaubois division is installed as garrison of seaport of Livorno (aka Leghorn). June 30th - The citadel of Milan surrenders to General Despinoy. July 1st - Bonaparte dines with the Grand Duke of Tuscany in Florence. Despinoy's division blockading Milan's citadel numbered 5,278 men and various garrisons numbered another 5,500 men. A force of about 12,000 reinforcements for the Army of the Alps under the command of Vaubois was on its way but would not arrive until early in June. Baron Johan Peter Beaulieu commanding. Starting on the 22nd of May Bonaparte's field divisions under Massena, Augereau, and Serrurier with Kilmaine's Advance Guard in the lead made their way towards the line of the Mincio via Crema, Soncini, and Brescia. Massena marched on the left wing to the north, Augereau in the center, and Serurier on the right. They met no serious opposition although the Austrians did break bridges and destroy ferries on the rivers Oglia and Chiese. The rivers although still rising posed no serious obstacle, the French were able to either find fords or build bridges. By the 28th of May the French were poised to attack Beaulieu's forces behind the Mincio. From the 24th on Bonaparte was absent dealing with revolts in Lombardy principally Milan and Pavia leaving Berthier to manage the movement forward the best he could. Berthier is on record complaining about incomplete and difficult to read (being in pencil) orders. Bonaparte rejoined his Army Headquarters at Brescia on May the 28th. The stage was set. Bonaparte issues orders for the attack on the Mincio late on the 29th and his divisions set off early on the 30th. See the battles page entry for Borghetto for more details. 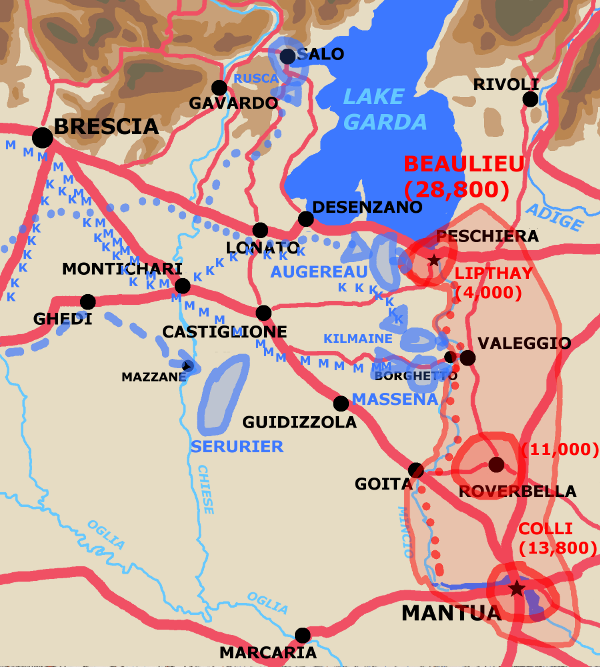 His cordon pierced at Borghetto (opposite Valeggio sul Mincio) Beaulieu retreated with his disorganized and demoralized field forces up the Adige towards the Tyrol leaving Mantua to its own devices. 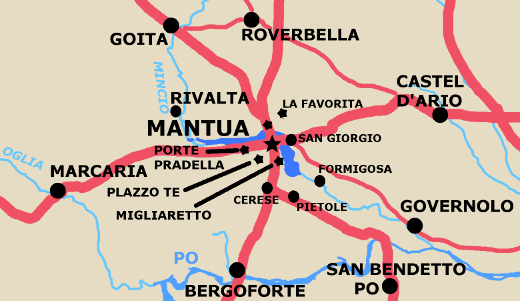 Map of area around Mantua. Note from the map that there are four main ways into Mantua. First across the causeway from the north where the French took up a position at La Favorita. Second across another causeway from the east from the, at that time, unfortified town of San Giorgio (Saint-Georges in Bonaparte's correspondance). Third along the river from the south which was guarded by the entrenchments of Migliaretto. Fourth along the river from the west through the Porte Pradella guarded by the hornworks of Pradella. Between Porte Pradella and the entrenchments of Miglieretto was the Plazzo Te which faced to the south what was apparently an impassable swamp at that time. Mantua had only very narrow approachs which made it hard to take by assault but easy to blockade. Unfortunately for attackers the swamps in the vicinity and the hot muggy summers made it a dangerous place for an army due to endemic disease. 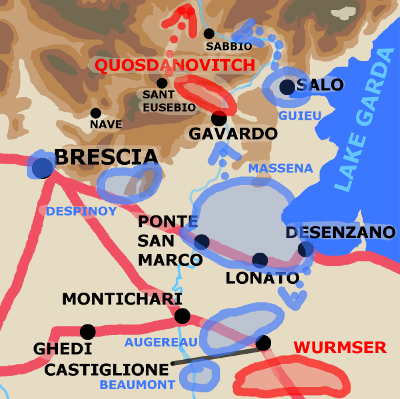 Sauret's Division (4,500) west of Lake Garda at Salo, Gavardo, Desenzano and Brescia. Augereau's Division (5,000) at Leganago and along the Adige near it. 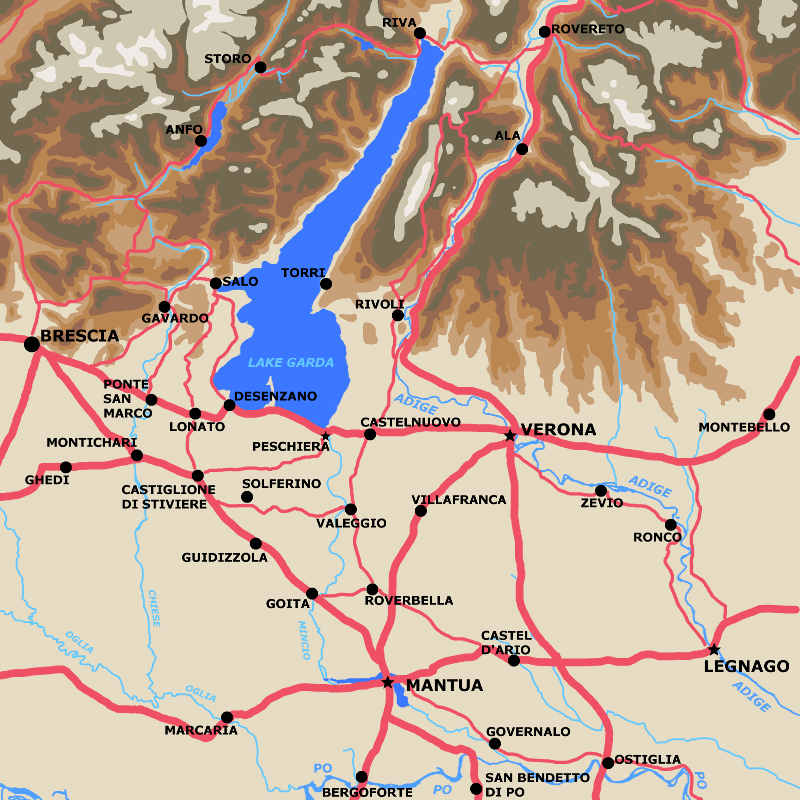 Despinoy's Division (5,500) at Peschiera and along the Adige. Vaubois commanded a garrison of about 2,500 at Leghorn in Tuscany. Overall Bonaparte had, including the troops blockading Mantua, about 42,000 men available in theatre. If he called in garrisons and detachments he might be able to raise that to close to 50,000. New troops from Germany and Austria forming at Trent and the area north of it 33,000 men in number. The demoralized remains of Beaulieu's army around Roveredo 16,000 in number. General Count Canto d'Irles commanding a garrison in Mantua of 12,345 infantry, 13,753 men including cavalry, engineers, boat crews, artillery, etc. Augereau reached the northern outworks of Mantua on June 1st. By the 2nd of June his and Serurier's division were investing it. Augereau to north and east of the Mincio, Serurier to the south. As what heavy guns Bonaparte had remained at Milan trying to reduce the citadel there this was, for the time being, just a blockade of the city. On June 7th Berthier, Bonaparte's chief of staff ordered a bridge be built across the Mincio below Mantua to properly connect Augereau's and Serurier's forces. The expeditions of Augereau and Vaubois in mid-June resulted in the surrender of significant heavy artillery from the fortresses of Modena, Fort Urban, and Ferrara. The surrender of the citadel of Milan at the end of June not only freed up the guns being used in the seige it also added more captured guns. Having scraped up the required ordinance it still had to be moved. Considerable effort building platforms for the guns and defences for them was also needed. On July 18th the seige guns began to fire and the first parallel opened. The seige of Mantua had begun in earnest. Bonaparte's chief engineer promised to reduce Mantua in twenty days. Map showing situation 28th July. Overall the French field forces consisted of about 42,000 men. Overall the attacking Austrians forces consisted of about 46,000 men. The Austrians nominally had another 10,000 to 13,000 men in Mantua but just how many of these were fit for field operations is unclear. Many were certainly sick both officially and in fact. Following their severe reverses in Italy the Austrians transferred 25,000 men and several new generals ( FML Davidovich, FML Maszeros, FML Quosdanovich, GM Bajalich, GM Ott, GM Ocskay, GM Spork, GM Ruess) from Germany. An additional 8,000 men were sent directly from Austria. The new commander of the Austrian forces was Field Marshal Count Dagobert-Sigfismond de Wurmser. Wurmser's counter offensive began on July 29th. He broke his forces into four columns. 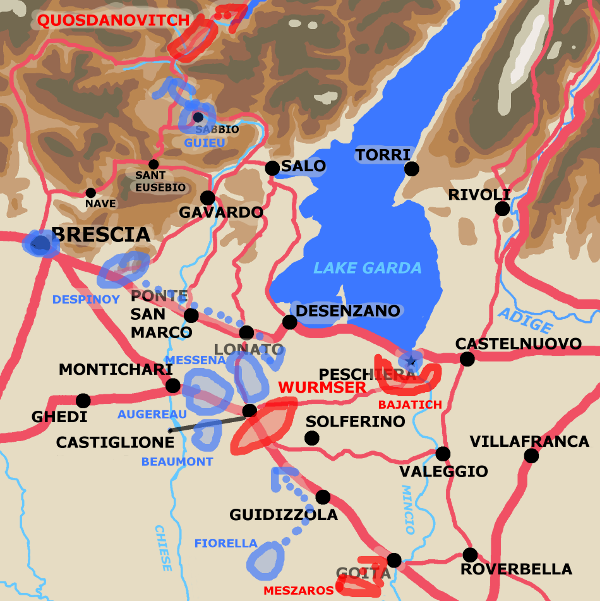 The westernmost column under Quasdanovich with 18,000 men organized into four brigades and two advance guards attacked to the west of Lake Garda through Stora and down the valley of Lake Idro and the Chiese river. He surprised the French at Brescia, Gavardo and Salo. There were two center columns that marched south just to the east of Lake Garda. One with Melas commanding and 14,000 strong marched down the western, right side of the Adige. The other Davidovich commanding and 10,000 strong marched down the eastern, left side of the Adige. Wurmser accompanied these central columns which were in communication range even if the river between kept them from easily supporting each other. Finally far to the east was a column of 5,000 men under General Meszaros which moved down the Brenta valley to Bassano and from there through Vicenza to Verona. 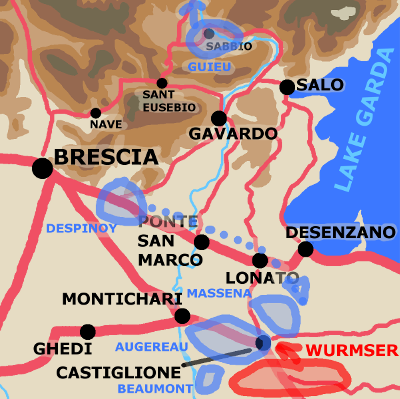 Wurmser's central columns pushed back Massena's outnumbered troops in the Adige valley and the heights above it, but the real threat was Quasdanovich's western column which was close to severing all of the Army of Italy's lines of communications. Map showing Western part of Theatrer. Napoleon was in Brescia on the morning of July 29th. Hearing that Wurmser had, early in the morning, pushed back Messena's lead brigade under Joubert from the positions of Corona and Brentino he rushed to be closer to the scene of the action. Massena had taken heavy losses, well over a thousand men, Bonaparte wrote him on the morning of the 29th from Montechiari, where the road from Brescia to Castiglione crosses the Chiese river, telling him not to despair. Sometime later that morning Bonaparte received word that a large force of Austrians, Quosdanovitch's column, was approaching on the west side of Lake Garda. 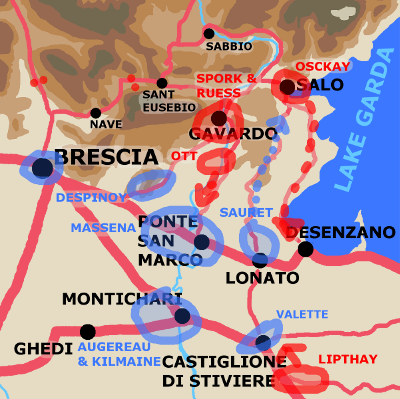 Bonaparte had not thought the route to the west of Lake Garda to be practical for a large force and now his line of communications which ran through Brescia was under threat. As Bonaparte wrote in a letter to General Gaultier the situation was critical. Bonaparte dispatched a flurry of orders from Montechiari that day. Initially he gave orders to Augereau and Massena to prepare for a counter attack to be executed at 11:00pm that evening. Augereau might have to abandon the line of the Adige. Sometime probably before midday Ott's brigade of Quosdanovitch's force pushed part of Sauret's division out of Salo. Sauret retired on Desenzaro further along on the shores of Lake Garda. 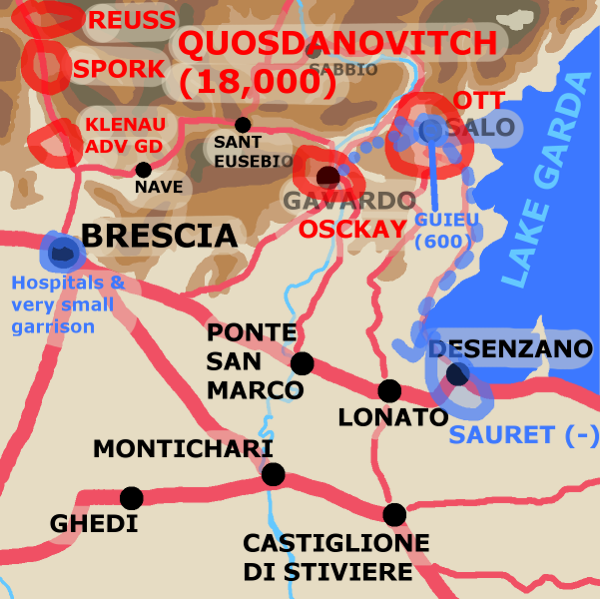 About midday Osckay's brigade pushed Guieu out of Gravodo on the Chiese. Guieu retreated to Salo where in the afternoon he holed up in a large house with 600 men. They were beseiged on all sides by the Austrians. Note how Guieu somehow managed to slip into a town the Austrians had taken earlier that day from the French directly under his divisional commander, Sauret. The terrain around this corner of Lake Garda appears to be so broken that the sort of mishap where a force going from one town to another would miss an enemy going in the opposite direction was common. If they took slightly different routes they wouldn't see each other. 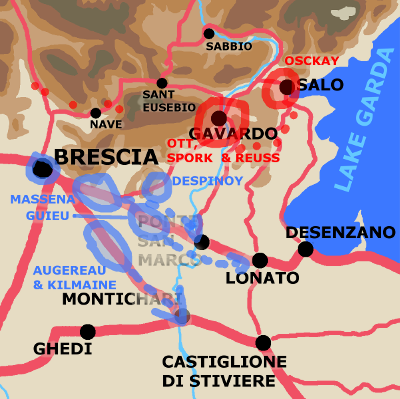 In any event Osckay appears to have pursued Guieu to Salo and that evening was ordered to take over the seige of Guieu in Salo while Ott took responsibility for the central force on the Chiese at Gravado. Gravado is where the road from Brescia to Salo crosses the Chiese. Map showing situation in western part of the theatre on the 29th of July. As the news of Quosdanovitch's attacks came in Bonaparte, still at Montechiari, changed plans. Augereau was directed further west to Roverbella. General Guillaume holding Peschiaria was to facilitate support by Despinoy to Sauret. Bonaparte wrote an order early on the 30th that had him aware of both Quosdanovitch's attacks on the 29th and of further attacks that had occurred that day. From an unknown location Montechiari or Desenzaro or Castelnuovo somewhere in between them he writes to Augereau that his line has been pierced in three locations. These being la Corona and Rivoli defended by Massena, Salo and Ponte San Marco on the Chiese defended by Sauret, and Brescia. As Brescia was not reached by Quosdanovitch's advance guard under Colonel Klenau until 10:00 am on the 30th this order of Bonaparte's must have been written afterwards. Colonel Klenau was followed by Spork's brigade with Quosdanovitch himself at noon, and later Reuss's brigade. In the meantime Ott who'd been ordered to Lonato reached Ponte San Marco and halted there as his men were tired and hungry. Osckay remained at Salo holding it in defense of Quosdanovith's communications and carrying on the seige of Guieu. Ponte San Marco is on the road that runs from Brescia to Verona via Lonato, Desenzano, Peschiara, and Castelnuovo where it crosses the Chiese. At midnight on the 30th Quosdanovich with most of Spork's and Reuss's brigades marched on Montechiari which lies south of Ponte San Marco where the road from Brescia to Mantua via Castiglione and Goito crosses the Chiese. Bonaparte had already earlier that day written from Desenzaro to order Sauret and Despinoy to be ready to attack Salo at "daybreak". This likely meant daybreak on the 31st as even if Bonaparte was writing very early on the 30th there wouldn't be time for his order to both reach Despinoy and allow that general's dispersed brigades to march to Desenzaro and be ready to attack. Map showing situation in western part of theatre on the 30th of July. A second flurry of orders from Bonaparte on the 30th followed from Castelnovo. 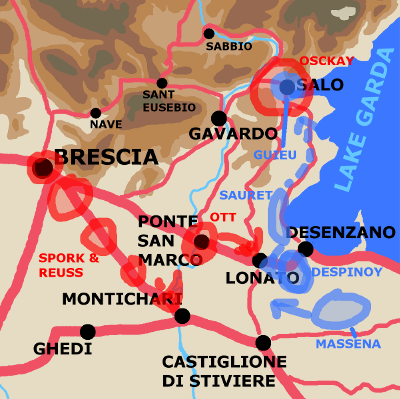 Massena was ordered to reconnoiter a route for retreat through Peschiera then Castiglione and then south of Brescia via Ghadi to Orzinovi on the Oglia opposite Soncino. He was ordered to hold the Mincio crossing between Broghetto and Valeggio with 1,500 men. In one dispatch he is ordered to place part of his division in the rear of the Mincio at Peschiera. Three of his brigades, those of Rampon, Cervoni and Robert, are to spend the night at Roverbella behind the Molinella. Kilmaine is to join them. Augereau (whose troops spent the day marching and counter marching) is also behind the Molinella at Castelaro (modern Castel d'Ario on the road from Legnato to Mantua between Nogara and the Castello de San Giorgio causeway to Mantua). Serurier is ordered to prepare to evacuate or dispose of his artillery and to make sure of all the vital river crossings. The HQ is moving to Goita on the Mincio. Map showing situation in western part of theatre early on the 31st of July. By the 31st Bonaparte had reached Roverbella. He dispatched another set of orders from there. He had decided to concentrate his army and move west against Quosdanovich. He orders Serurier to turn his troops in La Favorita and Saint-Georges, at the ends of the causeways across the Mincio from Mantua, over to Augereau. They will pass over the Mincio at Gioto. The rest of Serurier's division will retreat to Marcaria on the Oglia. He writes Massena that he is marching with Augereau and a column of 12,000 men to Montechiari on the Chiese. 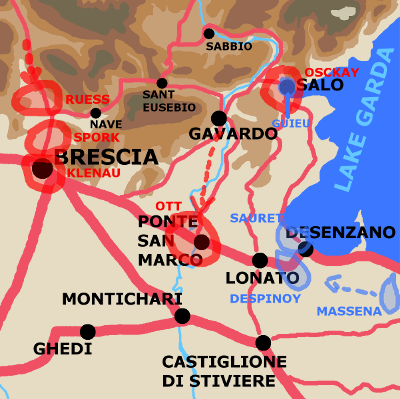 From there in concert with Sauret's and Despinoy's divisions he will attempt to retake Brescia. Massena is ordered to the vicinity of Castiglione and Lonato. At 0900 am on the morning of the 31st Quosdanovitch reached Montechiari with the brigades of Spork and Reuss. He rested there most of the day. "First thing in the morning" of the 31st Ott's brigade attacked Lonato driving the French out, but then ran into Despinoy with 4,000 men apparently Bertin's brigade. Bonaparte also claims to have ordered a counter-attack by a brigade under Dallemagne. The exact course of events was a matter of controversy between Despinoy and Bonaparte but Ott was forced out of Lonato and retreated to Ponte San Marco. This action is usually known as the "First Battle of Lonato". In the meantime Suaret had marched on Salo from Desenzaro, forced the Austrians under Osckay out and relieved Guieu, however, being without the support of Despinoy who'd been busy elsewhere he decided to retreat and marched back to Lanoto. So the late afternoon of the 31st found Massena with Sauret and Despinoy all in Lonato and Ott back at Porte San Marco. The French generals decided to march on Porte San Marco. Quosdanovitch arrived at Porte San Marco at or a little after this time with the brigades of Spork and Reuss having left Colonel Klenau at Montechiari. His initial plans were to retake Lonato but at 09:00pm (2100) he heard of Salo having fallen and decided to march on Gravado with Spork's and Reuss's brigades which departed at 10:00pm. Ott was left to hold Porte San Marco and was supposed to march to rejoin the Quosdanovitch the next morning. What precisely happened to the intended French attack on Porte San Marco is unclear perhaps it was called off because of the arrival of Quosdanovitch with reinforcements. Map showing situation in western part of theatre late on the 31st of July. Wurmser in the east spent the day closing up to the Mincio. 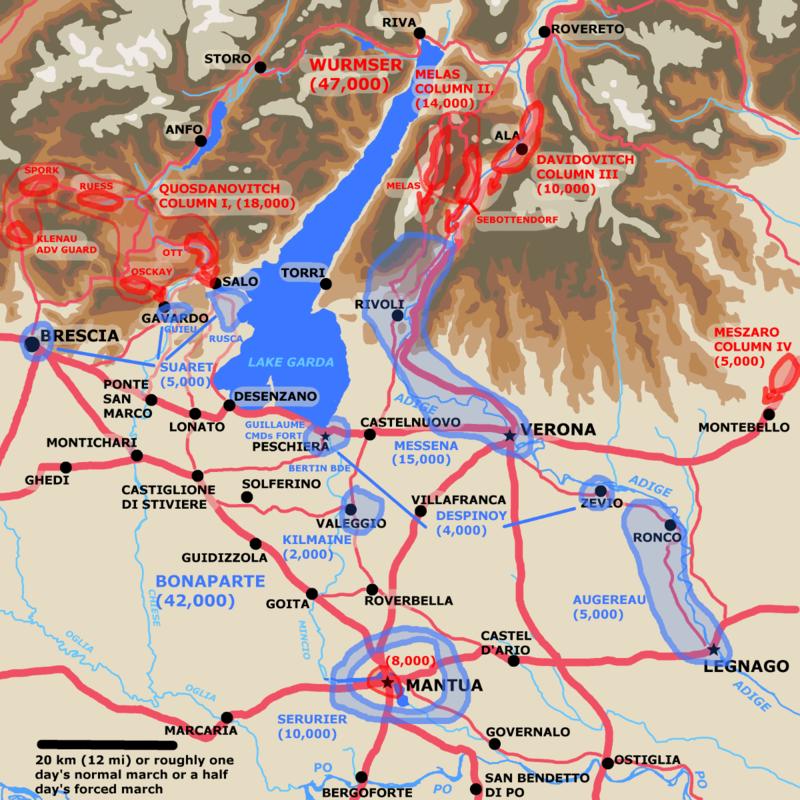 That night (31st July/ 1st August) the siege of Mantua was lifted. Wurmser realized this early on the 1st, also that Quosdanovitch was in some danger. Klenau's small detachment at Montechiari was attacked by Augereau at daybreak on August the 1st. By 0800 Klenau had started to retreat to Brescia which he reached by 1100. 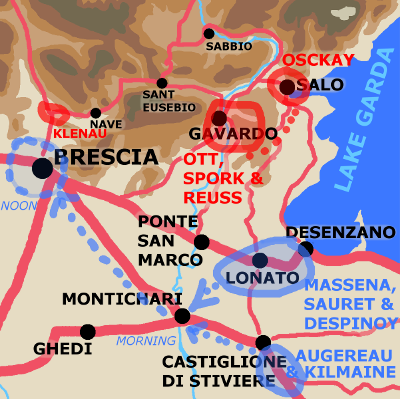 By midday the French main force had retaken Brescia. Bonaparte had realized his main objective and restored his communications. He had also managed to concentrate his dispersed forces. Bonaparte still needed to defeat Quosdanovitch before Quosdanovitch could unite with Wurmser. United the Austrians would outnumber the French. Quosdanovitch was with the brigades of Spork and Ruess at Gavardo at midday on August the 1st. He was informed about this time both that Brescia had fallen to the French and that they had abandoned Salo. Afraid for his communications he set up a cordon defence between Salo and Porte San Marco. A lull in action by both sides at this time seems to have lasted for the afternoon of the 1st. Map showing situation in western part of theatre early on August 1st. Quosdanovitch remained inactive for the morning of August the 2nd. Bonaparte wrote from Brescia early on the 2nd of August that he was seeking a battle that would decide the fate of Italy. Having quickly reorganized his now concentrated forces he marched from Brescia in the wee hours (0300) of the 2nd. Despinoy on his left went to Rezzato at the corner of the mountains blocking the direct route to Salo, Massena in the center marched on Porte San Marco, Sauret's division now commanded by Guieu marched on Lonato, and Augereau on the right marched on Montechiari. French Army of Italy reorganization of August the 2nd. 27th demi-brigade light infantry called the "Allobroges"
Map of western theatre showing situation early on August the 2nd. Quosdanovitch waited on events until mid-day of the 2nd when, having received more information and a letter from Wurser, he issued orders for his brigades to move forward. To quote Martin Boycott-Brown directly: "His plan was for Osckay to go south to Desenzano, then turn west and meet Ott at Ponte San Marco in the morning, after which the two would march on Brescia. The bulk of Quosdanovitch's column would more south to Montechiari, where it would await Wurmser. " Note that these orders don't have Quosdanovitch's forces moving until the morning of the 3rd and that "the bulk of Quosdanovitch's column" would have meant the brigades of Spork and Ruess with the advance guard of Klenau, and perhaps the other advance guard minus detachments he'd made to guard points on his communications through the mountains. Map of western part of theatre showing situation late on August the 2nd. Early on the 3rd Quosdanovitch learned from Ott that somehow a strong French column (Sauret) had missed Osckay marching south and that Salo was in danger of falling. He dispatched Ruess to deal with this threat. Bonaparte had in fact ordered both Sauret from the south at Lonato and Despinoy from the west to advance on Salo and Gavardo respectively. Dallemagne's brigade was to join them. Note that the re-organization has Dallemagne as one of Sauret's brigadiers which would have Sauret with only Guieu's brigade for the attack on Salo. Augereau was ordered to attack Wurmer's advance guard at Castiglione. Massena was ordered to advance from Porto San Marco to Lonato. From there he could support either Augereau or the attack on Quosdanovitch as needed. The outcome of these ordered movements was that Despinoy moving on Gravado encountered Ott's troops just short of that place, and attacking hastily was beaten off and retreated just as hastily. Once again Bonaparte had assigned Despinoy a key role in cutting Quosdanovitch communications and Despinoy had flubbed it. Several days later on the 6th he was to be re-assigned to a the fortress command of Alexandria and his real contributions minimized in a report to the Directry. Later in the month in another report to the Directory Bonaparte would describe Despinoy as not fit for field command. The battle against the Austrian main force (Ott & Spork) at Gravado was taken up by Sauret's division with Dallemagne and Guieu's brigades. Reuss who had been sent in search of him had somehow missed Guieu. Guieu took Salo in the morning and then moved on Gavarado hitting Quosdanovitch in the rear and taking his artillery park. Quosdanovitch counter attacked with Spork's brigade, retook the artillery park and drove Giueu back to Salo. In the meantime to again directly quote Martin Boycott-Brown: " Dallemagne had engaged Ott, and even managed to go around his flank and reach Gavardo, but was then forced to retire and prepare another effort." This left Quosdanovitch with Spork's brigade holding the heights above Salo. This secured his communications along the Chiese. Ott was at Gravado. Quosdanovitch hadn't heard from either Ruess or Osckay since midnight. He waited on news of them. Dallemagne attacked again and taking Gravodo cut off communications between Ott and Quosdanovitch. Ott counter attacked driving Dallemagne back towards Brescia thereby restoring the Austrian position. Later that night Ott was ordered to join Spork on the heights near Salo. Despite having failed to decisively defeat Quosdanovitch the French had prevented three of the four Austrian brigades from carrying out their planned movements. Ott had not moved on Ponte San Marco. Spork was tied down holding the Austrian line of communications open. Ruess had gone off on a wild goose chase somewhere between Salo and Descenzano. Osckay's brigade was moving forward alone. Initially Osckay had some success. Martin Boycott-Brown writes that early in the morning he'd reached Desenzano and attacked Pijon's brigade at Lonato vigorously. He took Lonato making Pijon prisoner in the process. Unfortunately for Osckay the rest of Massena's division along with Bonaparte himself was present and counter attacking with the aid of cavalry they forced him out of Lonato. 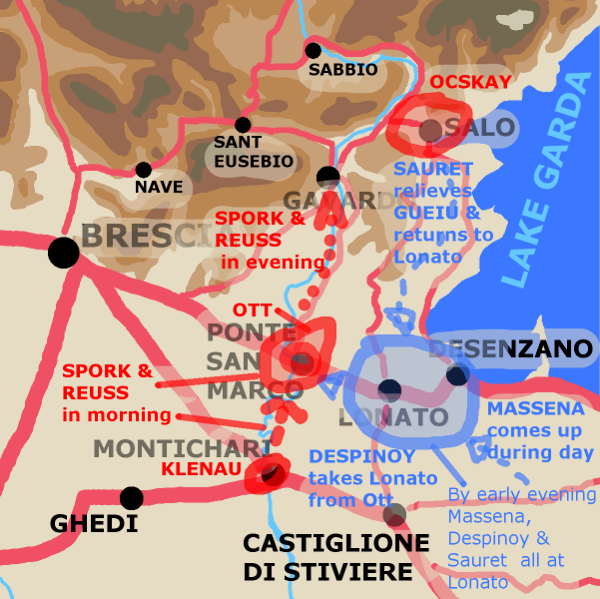 Then " Osckay was encircled and forced to surrender with most of his brigade "
Ruess arrived in Desenzano about this point and managed to save at least some part of Osckay's brigade. Faced with Massena's full division he was forced to retreat receiving a beating himself in the process. This action became known as the "Second Battle of Lonato" and was likely the decisive event of the Castiglione campaign. Later that day, the 3rd of August, Quosdanovitch with less than 10,000 of his original almost 18,000 men left, and with his brigade commanders no longer willing to fight, ordered a retreat back into the mountains that was to begin the early hours of August the 4th. Wurmser was left to face Bonaparte's entire army alone. Map of western part of theatre showing situation on August the 3rd. See the battles page entry for Lonato for more details. Wurmser, although still uncertain of Quosdanovith's location and how matters had gone with him, had attempted to reach him. During the 3rd of August Wurmser's advance guard under Lipthay with 4,000 men at Castiglione was attacked by Augereau who with 11,000 men heavily outnumbered him. Lipthay nevertheless managed to hold on until Wurmser could bring most of the rest of his column up. By the evening of 3rd the Austrians had 20,000 men present at Castiglione. The Austrians now had the numerical advantage but it was late and having force marched they were tired. Wurmser decided not to attack that day. Bonoparte himself at arrived at Castiglione by that point. Not aware that Quosdanovitch was about to throw the towel in he ordered further attacks by Despinoy and Guieu on Quosdanovitch's forces for the next morning. Quosdanovitch's retreat did not occur without incident but by the morning of the 4th it was clear to Bonaparte that Quosdanovitch was in fact in retreat. Wurmser who still felt his troops had "suffered to much" declined to attack on the morning of the 4th giving the French some much needed breathing space. 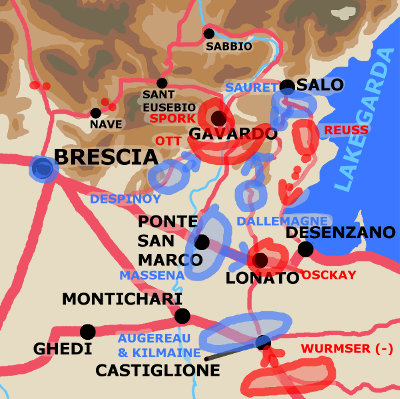 At 0800 on the 4th Bonoparte issued orders for Serurier's division (temporarily commanded by Fiorella), Despinoy and Massena to move on Castiglione. Despinoy and Massena were to move by night marchs they'd not arrive until the next day, the 5th. Wurmser having received the news of Quosdanovitch's withdrawal from Maelcamp, who commanded the Austrian naval force on Lake Garda and who had observed and helped Reuss's brigade during its retreat in the face of Massena, had given up trying to beat the French. He knew that alone he did not have the numbers. He was just playing for time for Manutua to be reinforced and reprovisioned. His situation was such that retreating without a fight was not possible. Neither side had a decisive advantage during the 4th. The French with all of Augereau's division and part of Massena's which was reconcentrating having dispersed in the fight against Quosdanovitch roughly equalled the Austrians in numbers. The day passed in skirmishes and minor maneuvers. Map of western part of the theatre showing situation on August the 4th. The morning of the 5th arrived without either Fiorella or Despinoy having arrived. Bonaparte still did not have a numerical advantage. He ordered an unusual retrograde movement in order to draw the Austrians out of their positions and to buy time for his reinforcements to arrive. Map of the western part of the theatre showing situation on August the 5th. Around 0900 the approach of Serurier's division under Fiorella from behind the Austrians became apparent and Bonaparte ordered an engagement along the whole line. Despinoy arrived before 1000 in a most timely fashion. A couple of hours of fierce fighting saw the outnumbered Austrians who were also threatened from the rear retreating back to the Mincio. The French exhausted from constant fighting and forced marchs were too tired to effectively pursue. This was the battle of Castiglione and it was a great French victory. Map of wider theatre showing situation on August the 5th. See the battles page entry for Castiglione for more details. August the 6th saw the French pursuing Wurmser back across the Mincio and back the way he'd come through the mountains. Mantua was again under blockade, but having lost his seige train Bonaparte could not hope to mount a proper seige. He was forced to let time, disease, and hunger do his work for him. In the meantime the Austrians would make several more attempts to relieve Mantua. The Austrian army had lost 12,500 men roughly a quarter of their force. The French forces also took severe losses, Bonaparte admitted to 7,000 men. Both sides had lost much material and some superb officers as well. They'd take some time to lick their wounds, but a month later they would face off again as Wurmser made his second attempt to relieve Mantua.
" During May Bonaparte extorts ..." Gustav Joseph Fiebeger's "The Campaigns of Napoleon Bonaparte of 1796-1797", locations 284-293 of Kindle e-book version.
" May 21st - Bonaparte learns formal peace ..." Esposito and Elting's "A Military History and Atlas of the Napoleonic Wars" a.k.a. "The West Point Atlas" narration Map 11.
" and several new generals ..." Martin Boycott-Brown's "The Road to Rivoli", page 361, supplemented for GMs by The Napoleon Series biographical dictionary.
" Initially he gave orders to Augereau and Massena to ... " Correspondance #796 and #797 "vous attaqueriez" ... "et si, a onze heures du soir, vous n'avez pas de contre-ordre, mettez-vous en marche pour l'executer." Bonaparte's original intent appears to have been there for the planned counter attack.
" ... the situation was critical ..." Correspondance #804 to General Gaultier "Les cerconstances sont assez critique." " Bonaparte's first order on the 30th ..." Correspondance #806 to General Augereau. Actually as #808 from Desenzaro is an order to the commissionare at Brescia to evacuate to Milan it's not unlikely #806 is out of order and was written somewhere between Desenzaro and Castelnuovo.
" The terrain around that corner of Lake Garda ... Lake Garda was once apparently the site of a glacier and a line of morainic hills, deeply cut in places by streams, lies between it and the almost perfectly flat Po Valley floor. This line runs from a point between Gavarodo and Salo, past the east side of Lonato, to Castiglione, through Solferino and goes on to to reach the Mincio around Borghetto and Vallegio sul Mincio. This can be seen in a number of different maps. Allisons Atlas for Castiglione, or Google maps in 3D mode will do.
" By the 31st Bonaparte had reached Roverbella ... " Correspondance #813,#814, and #815 to Generals Serurier, Kilmaine and Massena respectively. As Bonaparte was accompanying the main column under Augereau any orders he gave to this, his main striking force, were likely verbal and therefore not in the written record or at least his correspondance. Martin Boycott-Brown provides translations of the key parts of these dispatches on pages 384 and 385 of "The Road to Rivoli".
" Bonaparte also claims to have ordered a brigade under Dallemagne ..." In his report to the directory Correspondance #812 written from Castiglione on the 6th of August. This claim seems improbable. Not impossible but improbable on a number of grounds. First Dallemagne's brigade had been one of Serurier's involved in beseiging Mantua. Bonaparte didn't order the transfer of these units until at the earliest sometime early on the morning of the 31st. Lonato is some 45 kilometers (27 miles) from the nearest seigework (Fort La Favorita) around Mantua. A good day's march for most armies at that time would be about 20km (12 miles) so this is already a forced march. Possible because Sauret in fact that day marched to Salo from Desenzano and then back to Lonato which was almost 40km (24 mi). Note however it took him most of the day. A good pace of march would likely be about 5km an hour (3 miles an hour) meaning that it would take 9 hours without breaks or detours to get from La Favorita to Lonato. French units could march faster for example we know the main column made it from Montechiari to Brescia in about three hours on the morning of August the first. The distance between Montechiari and Brescia being some 25 km (15 mi) this would be a pace of 8 km an hour (5 mi an hour) which doesn't seem unreasonable for moderate distances. It does seem a bit much for a 45km march but if Dallemagne's men could do it they would have covered the distance in 6 hours. We know Ott attacked early in the morning. If Bonaparte ordered Dallemagne to attack Lonato as a reaction to Otts attack as many accounts have then you have to add time for the news to reach him. Again this scenario is not impossible but it does seem to be a stretch. The very earliest Dallemagne could have arrived at Lonato assuming he left the vicinity of Mantua at 0100 on the 31st would have been between 0700 and 1000. A very tight fit. An explaination that might fit with the physical facts and Bonaparte's account would be that he ordered Dallemagne to join Massena at Lonato in the middle of the night of the 30th/31st and Dallemagne forced marched immediately to do so encountering Ott by accident at the end of his movement. A Second point that casts some shade on this possible explaination is that the orders Bonaparte gave on the morning of the 31st from Roverbella seemed to envision his units moving during the day and night of the 31st to be ready to attack in concert at daybreak on August the 1st. Daybreak on August the 1st is in fact when the main column under Augereau and Bonaparte attacked the small Austrian outpost under Colonel Klenau at Montechiari before driving on to Brescia. It's not impossible he gave verbal orders to Dallemagne that were an exception but it does seem like a lot of conjecture to maintain the crediablity of man who was known to lie shamelessly for political or morale reasons. Thirdly, again, Dallemagne's brigade was an important part of the seige of Mantua. We know by all accounts that the seige was not lifted until sometime late on the night of the 31st or very early on August the 1st. Yet the First Battle of Lonato had been fought the previous day. Is it likely that a major part of the beseigers could have broken camp and left a day before and the Austrians didn't realize the seige was being lifted? Fourth and finally, we have an account of the actions by the 5th demi-brigade for that day. This account found in the Austrian archives by Bernhard Voykowitsch is reported an article on the Napoleon Series website at https://www.napoleon-series.org/military/battles/c_lonato.html as of 2017-10-21. It appears Despinoy was at Desenzano with Bertin's Brigade, of which the 5th demi-brigade was the major part, on the morning of the 31st. We know his orders were to attack in concert with Sauret and take Salo thereby threatening Quosdanovith's line of communications and indirectly securing the French line of communications. Despinoy becoming involved with some hussars pursuing the French troops forced out of Lonato by Ott decided, in perhaps understandable violation of his technical orders, to counter-attack against this threat from Lonato on his rear left flank. He succeeded in this bravely and effectively and thereby won the first battle of Lonato. The unfortunate result of this tactical success was that Sauret despite taking Salo felt too understrength to hold it. Bonaparte likely planned that Massina, Augereau, reinforced by Kilimaine and units from Serurier would counter attack in concert against Brescia first thing on the morning of August the 1st. With Despinoy and Suaret holding Salo and being at least a threat to Quosdanovitch's communications and maybe even having broken them he could have at the very least forced Quosdanovitch back and taken Brescia in the process. There was a real chance of annihilating Quosdanovitch on the 1st. In the event despite the French taking Brescia on the 1st, Quosdanovich remained a threat and it took another two days to force him back. Bonaparte no doubt realized just how fortunate he was that Wurmser allowed him those two days, and likely was not too pleased with Despinoy for putting him in that danger, however reasonably and bravely. Also https://archive.org/details/campaignsnapole00unkngoog online as of 2017-08-30, first published West Point, New York, 1911. "The Bonaparte Letters and Dispatches, Secret, Confidential and Official from the Originals in his Private Cabinet, Vol. I "
In English but neither the translator nor the editors names seem to be given. N.B. : This volume appears to contain some useful letters from others to Bonaparte not present in the edition of Napoleon's correspondance below, in particular there's a very interesting letter from Sauret dated August 3rd where he pleas his case regards his first attack on Salo and gives additional detail on his actions in the intervening days. For supplemental details the Napoleon Series biographical dictionary for Austrian generals. As of 2017-10-17 see http://www.napoleon-series.org/research/biographies/Austria/AustrianGenerals/c_AustrianGeneralsIndexS2.html Use with care although very detailed and with information not easily available elsewhere in English some errors are (of course) present. For instance they have GM Oskay with one of the central columns not Quosdanovich. This variance in spelling matters because many placenames are very similar. In fact some are exactly the same (multiple Pradellas, Rivaltas, etc) and can only be understood in context or by long winded elaboration. 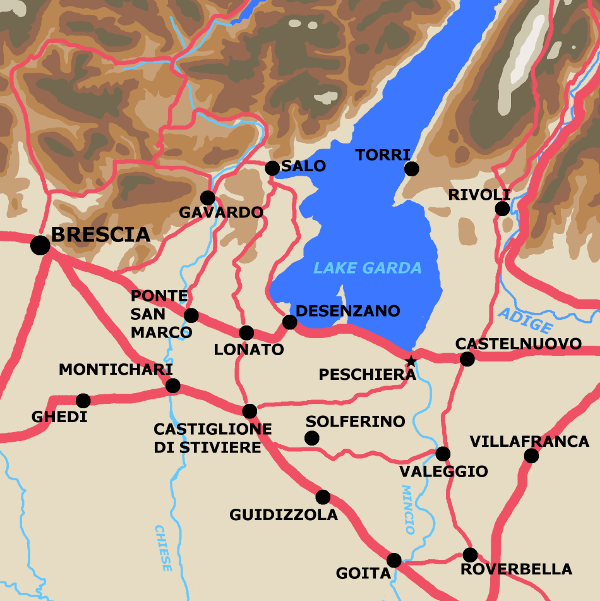 Many names are used in a shortened form, that is "Desenzaro" for "Desenzaro del Garda", "Peschiera" for "Peschiera del Garda", "Vallegio" for "Vallegio sul Mincio", "Rivoli" for "Rivoli Veronese", "Castiglione" for "Castiglione delle Stiviere", and so on.